Even in High School Patrick delved into graphics design, having helped set up some of the first computer labs at the local schools. Graduating from Napa Valley College with a degree in Humanities, Patrick had studied and taught many computer related courses and ended up in the fore front of Web design in 1994. Having done Graphic Design for a few years as P.Havens Creations before starting here at Minuteman, Patrick moved into the different areas of Printing from designing a job, prepping it for the press, running a press, to the final bindery. Here at Minuteman Press since 1997, Patrick has shown himself to be a most knowledgeable and talented person to work with. The fact that he has used most every operating system from Windows 3.1 to Windows 7, linux to MacOS, NeXTSTEP, OPENSTEP, MacOSX and a number of others... allows him to be able to figure out and accept most files. Born here in Napa and having moved back from a short time down Southern California, Patrick has two sons, Joseph & Liam who he devotes his spare time with. Patrick loves the Valley and all what the area offers. 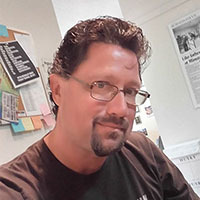 On the side Patrick writes for numerous blogs including Living in the Whine Country, is involved in the local Napa~Sonoma USBC as a Director and Youth Coach and many other pursuits.